One of the most exciting/scariest/saddest parts of your college experience will be graduation. This one day puts an end to all the late night, study sessions, and sleepless nights that you have had to get a piece of paper. It's a crazy experience but also one that you and the people close to you will cherish. One of the best parts before graduation is making sure to enjoy every last moment that you have at your university. For me, it was great because we had a week in between exams to spend time with the people who were there for me over the last 4 years (and then 2 years with my Masters). This meant lounging by the pool, having some drinks and sharing all the memories that we had made. 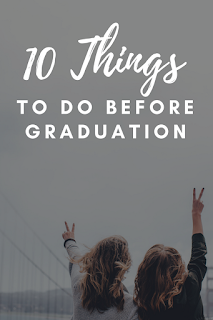 So before you toss your mortarboard into the air and say peace out to the place you've called home for the last few years, here are some things that you should consider doing! Go out with friends/host a get-together/go to a tailgate. Whatever floats your boat, make sure that you spend time with the people who make you smile, make you laugh, and people that you will miss once you leave college. Believe it or not, after you leave getting together with everyone is exponentially harder. Make a badass resume and a general cover letter that you can use for applications (jobs, internships and graduate schools included). Have a professor look at it this way once you're out in the real world you will be ready to get the job you want! DO SOMETHING THAT YOU WILL REGRET. Drink on the roof of a building on campus; go out with that guy who you have a crush on; go out to a party and enjoy it so much that the morning after is miserable. Whatever it is, make sure it is something that you have been wanting to do and haven't had the guts to do. Head out and support a sports team or a school activity. Believe it or not, going to a game is not miserable, there is a pre-game tailgate! Plus showing school spirit is part of college. Talk with your professors, the ones that have had an impact on you, and tell them that. They will be the ones that you will need for recommendations letters and possible job connections, so showing them that they impacted you will pay off. Break into the campus pool and throw a senior pool party. I did this at Wingate and although the water may have been freezing, the thrill of breaking in and then running when the campus security guard broke it up, I will forever say it was 100% worth it. Clean up your social media. 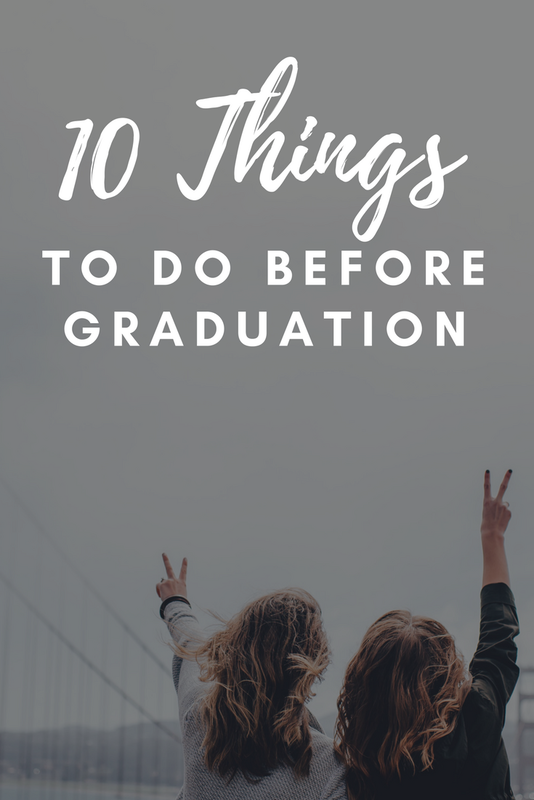 While I totally prefer the 'fun' things on this list, making sure that you are ready for the adult world is a necessary thing to do. And it is 100% true that some bosses will Google and check up on you before your hired, it happened to me in Indy. Go through all of your coursework and books and figure out what to keep. Creating a college reference binder will help for graduate school and reviewing things for your future jobs. Learn how to write a proper 'Thank You Note'. Not only will you need these for all the graduation gifts, but they are also lovely to give as one final Thank You for your professors.